How boards perform their dual role of supervisor and advisor of corporate management is difficult to observe from outside of the company. This column presents a survey of non-executive directors in various emerging markets which reveals substantial variation in the structure and conduct of boards as well as in directors’ perceptions about the local legal environment. Directors who feel adequately empowered by local legislation appear less likely to vote against board proposals, and also form boards that play a stronger role in the company’s strategic decision making. What makes a board effective? For years, policymakers and academic researchers alike have offered a similar answer to this question: an effective board is one in which its members are independent from the executives they are supposed to monitor. Such an answer is, however, too simplistic. Board members are appointed by shareholders to promote their interests and to supervise and advise the chief executive and other executives. In other words, boards perform more than one function. To evaluate board performance, we thus need to look beyond simple measures of board independence. How boards perform their dual role of supervisor and adviser of corporate management is typically difficult to observe from outside the company, and board conduct therefore remains an underexplored topic in the academic literature. This is particularly the case for boards in developing countries and emerging markets, where transparency and reporting requirements tend to be less advanced. Although corporate boards play an increasingly important role in many emerging markets, we still know very little about how effective they are and to what extent their functioning depends on external factors. Klapper and Love (2004) use data from 14 developing countries to show that firm-level corporate governance matters more in countries with weak legal environments, and that firms may partially compensate for ineffective laws by establishing good corporate governance. This insight is confirmed by Dahya et al. (2008), who analyse 799 firms (all with a dominant shareholder) in 22 countries. They find a positive relationship between corporate value and the proportion of independent board directors. Especially in countries with weak legal shareholder protection, dominant shareholders can appoint an independent board to assure minority investors that they will refrain from diverting resources. In recent work, we exploit data collected through an online survey of 130 current and past board directors (De Haas et al. 2017). These non-executive directors were on the boards of companies across 27 emerging markets and were all nominated by the European Bank for Reconstruction and Development (Figure 1). We use these nominees as entry points to access detailed information about the behaviour and conduct of their boards. Note: Map shows the number of respondents (board directors) by country. Darker colours indicate a higher number of observations per country. The resulting data allow us to create measures of advising and monitoring activity inside boards. In their monitoring role, directors are supposed to look after the interests of all shareholders – including non-controlling ones – and, sometimes, of other stakeholders, as stated in the local corporate law. While performing their duty, directors will often find themselves in disagreement with management and controlling shareholders. Such disagreement can lead to concrete actions, such as voting against management and/or controlling shareholders. In their advisory role, directors contribute with their business expertise to the formulation and implementation of a company’s strategy (e.g. Adams and Ferreira 2007). For such advice to be meaningful, the board needs to be empowered to make strategic decisions. To investigate the relative importance of the monitoring and advisory roles of boards, we analyse two subjective measures of decision making. The first relates to the board’s ability to participate meaningfully in strategic decision making. The second measure proxies for the frequency of disagreement between directors and the rest of the board. We find that in 52% of all cases, the board makes the final decision on strategic issues, while in 41% of companies it is the majority shareholder, and in the remaining 7% it is management. This indicates that in most companies, board directors are empowered in their advisory functions and do not limit themselves to merely monitoring management. However, the breakdown of answers also reveals striking differences between countries. One possible explanation for these cross-country differences is variation in the perception of the quality of the legal environment. Indeed, our data show wide variation in how board directors assess the quality of the local legal system and the extent to which it empowers them to fulfil their role. When board directors were asked whether courts in their country normally ruled fairly and objectively, exactly half of all board directors said they did, whereas the other said they didn’t. However, perceptions of court quality vary a lot across and within regions, ranging from 81% in central Europe and the Baltic states to only 21% in Central Asia. Relatedly, the survey also presented board members with a case study about a hypothetical conflict between shareholders and the board. Respondents were asked whether they thought that the courts in their respective countries would rule fairly and objectively in this case. The opinions were again split – around half of all board members said they did not think that this would happen. When asked whether local legislation gives the director enough power to fulfil their role within the board, the average score is 4.6 on a scale of 1 (“Strongly disagree”) to 6 (“Strongly agree”). Variation is again substantial with a standard deviation of 0.82. While 66% of the directors (strongly) agree that local legislation gives them enough power, the remainder agree only somewhat or even disagree altogether. 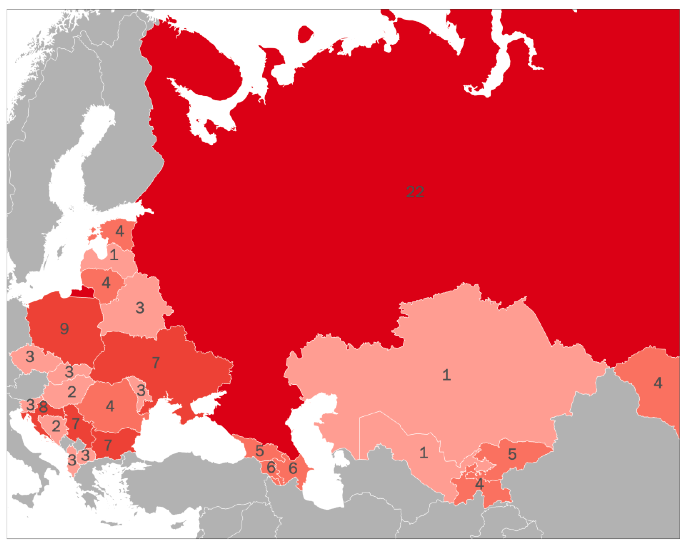 Legal empowerment is higher in central Europe and the Baltic states (4.9) and lower in Russia (4.4). Further analysis indicates that when board directors feel more empowered by the local legal system (that is, the ability of local laws to empower directors is above the mean), it is more likely that final decisions are taken by the board (58%) than when directors feel less empowered (39%). This analysis thus indicates that in case board directors are adequately empowered by local legislation, it is more likely that the boards they comprise play a stronger role in the company’s strategic decision making. The second measure of decision making inside the board is the proportion of directors who have ever voted against board proposals. Our data show that 69% of directors have voted against board proposals at least once during their tenure. Our sample directors thus appear to be significantly engaged in monitoring activities. We expect independent directors to vote against projects that may harm the interest of non-controlling investors. Thus, a high frequency of voting against projects could be explained by a combination of high levels of director independence and a large number of proposals that are harmful to the interests of non-controlling shareholders. We note, however, that the fact that a substantial minority of directors never votes against board proposals is not necessarily a bad thing, as it is quite possible for disagreements to be discussed and cleared up in the boardroom without a formal vote taking place. Lastly, we note that formal legal protection on the book may not apply in equal measure to all board directors, or may be perceived in different ways. The level of (perceived) legal protection may in turn affect directors’ inclination to actively vote against board proposals. Our findings indeed suggest that those who feel most exposed to a lack of legal back-up are the ones that resort more frequently to active voting. To put it the other way around, those that feel the power of the courts on their side are also those that are most at ease in the boardroom. Authors’ note: · The views are those of the authors and do not necessarily reflect those of the EBRD. Adams, R B and D Ferreira (2007), “A Theory of Friendly Boards”, Journal of Finance 62(1): 217–250. Dahya, J, O Dimitrov and J J McConnell (2008), “Dominant Shareholders, Corporate Boards, and Corporate Value: A Cross-Country Analysis”, Journal of Financial Economics 87: 73–100. De Haas, R, D Ferreira and T Kirchmaier (2017), “The Inner Workings of the Board: Evidence from Emerging Markets”, CEPR Discussion Paper No. 12317. Klapper L F and I Love (2004), “Corporate Governance, Investor Protection and Performance in Emerging markets”, Journal of Corporate Finance 10(5): 703–728.